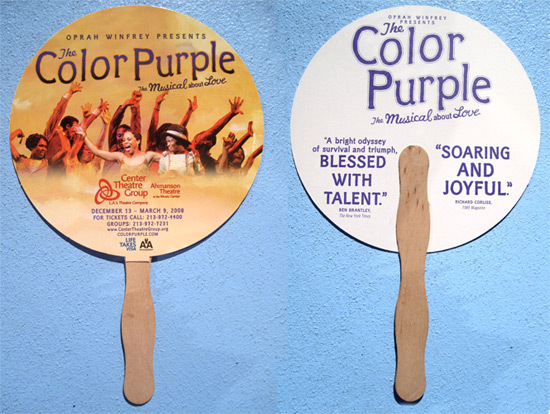 I’ll be waving one of these all day and night today as these are the final two performances of the First National Tour of my musical, The Color Purple. 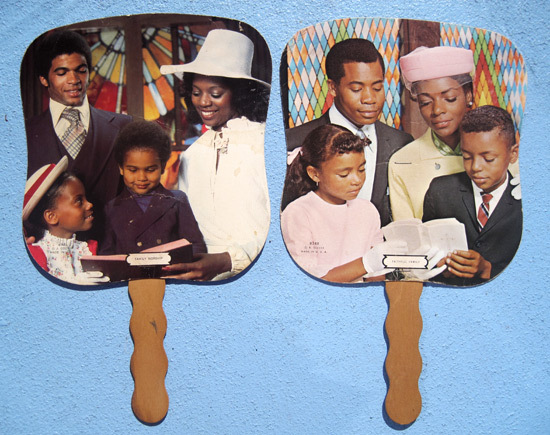 The whole 4-1/2 years I was writing this with Brenda Russell and Stephen Bray we waved these church fans and others from my collection of 60 from the 1950′s and ’60′s daily. I’ve been stuck on songs before but being stuck on a song for a musical when one has to consider way more then the singer or the content of the song like the plot, which we were writing at the same time as the songs, the dialogue, whether something should be musicalized or spoken, is there dancing to it or not, does the wig guy have enough time to make the wig changes, on and ever-increasingly on…, let me tell you the sweat pours down and these church fans, totally organic to what we were writing other than a couple decades too late, came in mighty handy. As a passionate collector, I love things to be very organic. In its simplest form, if you find a poster for an album you need to collect the album and anything else related to that group of recording sessions. 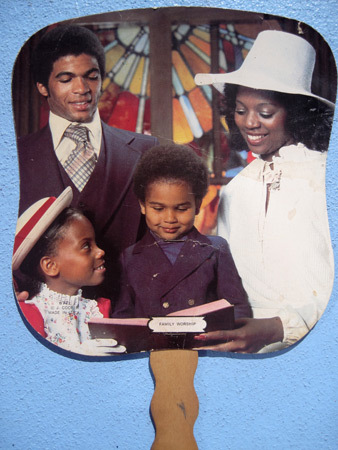 I had collected my church fans for years but I never had more organic moments then when Alice Walker, the Pulitzer prize-winning author of The Color Purple novel, would fly into LA every few months to listen to our progress and curl up in a fetal position in my Chromcraft purple lounger, close her eyes and listen to the new songs, smiling as wide as a mile while waving one of the fans, a different one each time, of course. … until the second national tour begins in two weeks. That will be a total surprise as I’ve never seen the production or met any of the cast. But I’ll be sure to have my fans in tow when I do. I’m still incredibly bleary-eyed from my month’s buildup to my Sound Of Soul extravaganza Monday night, the recuperation after from which I still feel numb not to mention running back and forth to The Pantages to see the final ever performances of my musical, The Color Purple, as originally conceived before it closes on Sunday and jumps to another tier of performance when the second national tour begins in a couple weeks. Honestly, I’d rather be lying in bed watching TV, my favorite sport, then running myself ragged like I was 16. 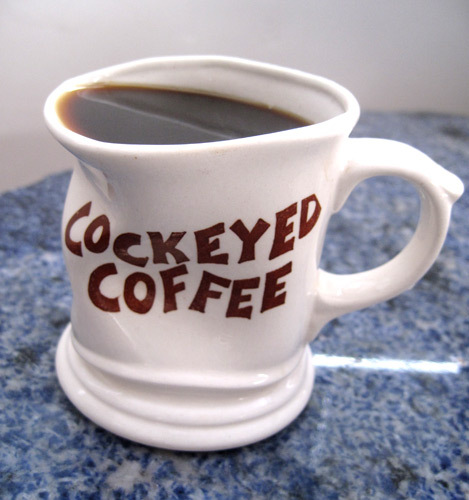 But I’ve never been the type to do the former and I seem to eternally be the type to act the latter so at least it makes me smile when my drinkware matches my state of mind. 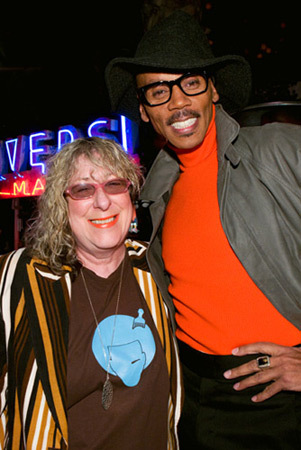 There it is this morning, right there on the homepage of the LA Times – the Sound Of Soul celebration at Willis Wonderland, the physical extension of The Allee Willis Museum Of Kitsch, to honor all things Soul – historic audiotapes and my collection of whacked out Kitschified Soul artifacts: http://www.latimes.com/theguide/events-and-festivals/lat-et-soundofsoul-pg,0,2371356.photogallery Movin’ on up! 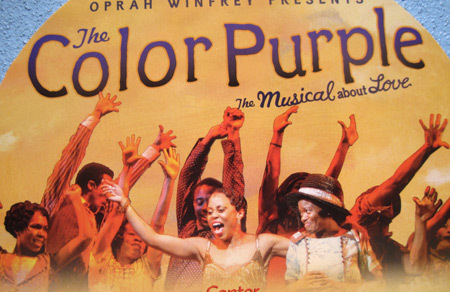 Allee Willis’ Kitsch O’ Soul O’ The Day – My Color Purple Sound Of Soul party! In anticipation of the throngs about to stroll through my house tonight for my annual Sound of Soul fundraiser with Pacific Radio Archives not to mention a celebration of the culmination of The Color Purple First National tour I thought that my James Brown whistle from the Godfather’s little known late 50s TV show, a rare item indeed, was the perfect Kitsch O’ The Day today. 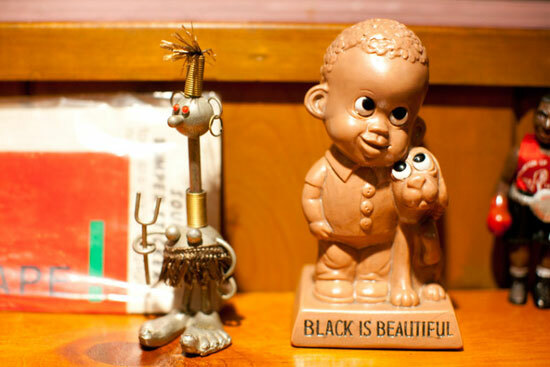 I rotate my collection fairly regularly but for this particular party everything in the house is part of my African American Pop Culture stash. 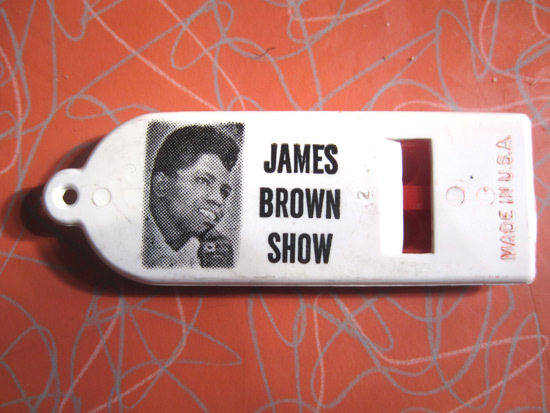 As I said yesterday, it was James Brown himself who encouraged me to keep collecting these Soul artifacts as there was usually no budget to market these products on a national let alone worldwide level so they were only popular regionally. 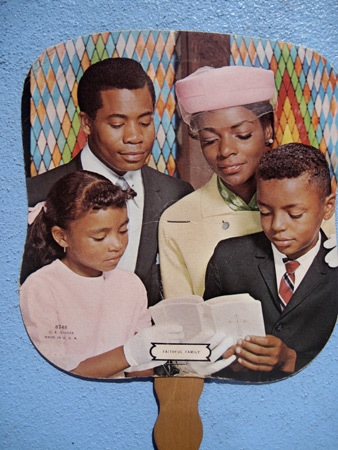 Like my game of Slang-A-Lang, Black Bingo, that was manufactured in 1969 in Detroit probably never got on shelves farther away than Cleveland. 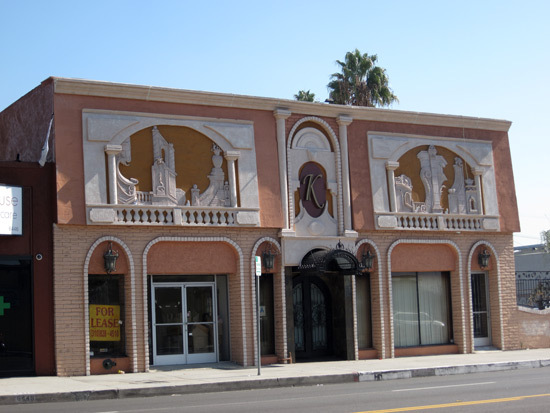 There’s a block of Lankershim in North Hollywood, CA that’s littered – I use that word lovingly – with square brick buildings adorned with Greek and Roman plaster columns, gods and godesses split in half and glued against the buildings in attempts to make them look like ancient Greek and Roman temples. I love this kind of architecture, especially when most of the time they’re trying to make strip joints look classy and exotic. That’s the case here. 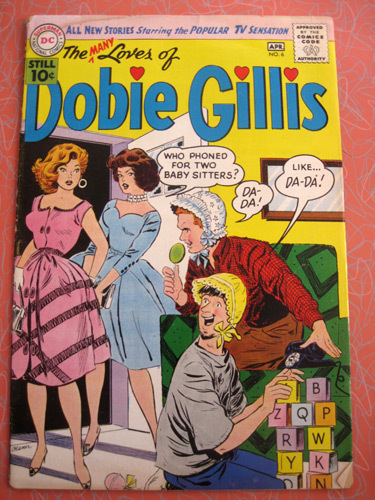 There’s no question that Dobie Gillis, which ran from 1959-’63, was just about my favorite TV show ever! 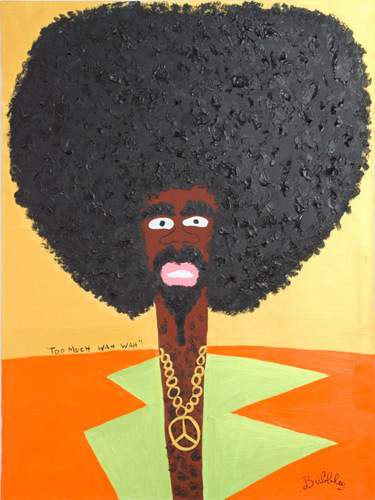 I was coming of age, wanted to be Thalia Menninger and date Dobie just like every other young nubian my age. I loved how preppy Dobbie was in his starched khakis but had the good sense to have Beatnik friends like Maynard G. Krebs. I didn’t catch Warren Beatty as the rich kid, Milton Armitage, so much but after he left the show I was heavily into his cousin, the ultra-snot, Chatsworth Osborne, Jr. And, of course, all hail Zelda Gilroy aka Shelia Kuehl, whose nerdiness paid off when she became a US senator in real life in 2000. 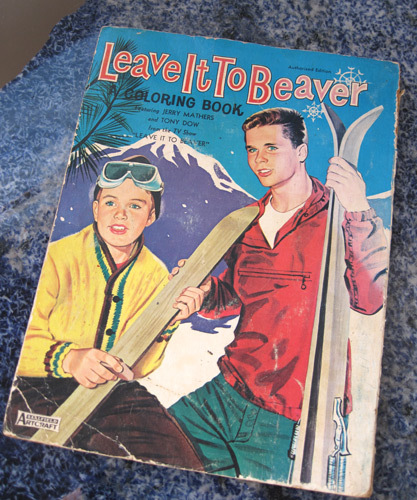 When I was a kid I was SO into Leave It To Beaver, probably as much because of the glow from the Sylvania Halo Vision tv I was watching it on and the Velveeta sandwich on white with one thin leaf of Iceberg draped across it that was the ritual meal of my childhood. I’m sure I’ve seen every single show of the original series that ran from 1957-’63. I was also into Lassie, My Three Sons, Dennis The Menace and other series that showed life from a kid’s point of view but I always liked Beaver because he was so inquisitive and annoying.